Pop-up exhibition in Stanley Picker Gallery Lobby accompanied by a short talk and reading, followed by Q&A. Come along expecting to hear a new take on an old question! The definition of ‘Art’ has exercised philosophers, artists and art-lovers for centuries, yet we are no nearer a consensus of what in fact it is. The one term not found in most dictionaries of art is the term ‘Art’ itself. 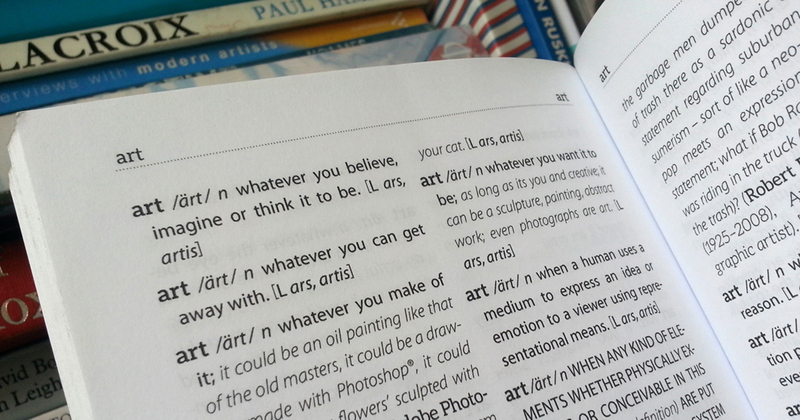 A New Dictionary of Art takes a refreshingly alternative approach, allowing you to take your pick from over 3,000 definitions compiled from the internet via chat-rooms and discussion forums as well as from more established authorities, artists and institutions. Passions run high as formal sits alongside informal, jocular alongside vulgar: all are left to fight it out on the page. Each entry is carefully alphabetised and has been valiantly edited and annotated for accuracy and completeness to the point of absurdity. By retaining the format and formality of a dictionary in this way, A New Dictionary of Art acknowledges with humour our continuing desire for absolute knowledge and certainty. The result is a streetwise cacophony of creativity and a wonderful and energizing summation of all the potentials that Art can be. “Weirdly but powerfully provocative… one of the most useful things I’ve read in a while” – John Clark, painter. Editor Robert Good is an artist who works with text to consider the frailties of language and the problems of knowledge. Deconstructing texts, systems and structures, Good’s meticulous doubt combined with a desire for certainty sets up a fault line of both tension and humour throughout his work. He is Director of Art Language Location in Cambridge and recent exhibitions include: Laboratory of Dark Matters, Cleveland Ironstone Museum and Obsessive Compulsive Practice, FAB Festival, Bath. Designer Jane Glennie is an artist and typographer (and Kingston University Alumni – MA Art & Space 2016) who works with installation and poetry film, while remaining fervent on the finer points of typesetting. Recent exhibitions include: We Need To Talk About Clothes, Hardwick Gallery, Cheltenham and 29th Festival Les Instants Vidéo, La Friche La Belle De Mai, Marseille, France and in 2016 she co-curated the ACE-funded festival Engage! at South Hill Park, Berkshire. She has recently set up the imprint Peculiarity Press and A New Dictionary of Art is its first publication.